Magshop.co.nz is one of New Zealand’s fastest growing online magazine subscription stores featuring over 150 popular titles from many of NZ’s leading publishers including Bauer Media Group, Tangible Media, Adrenalin and Parkside Media to name but a few. In addition to magazine subscriptions, Magshop also offers an array of related products including books, calendars, diaries and other branded merchandise. Magshop truly is a one-stop shop – so whatever magazine product is worth buying in NZ we sell it! 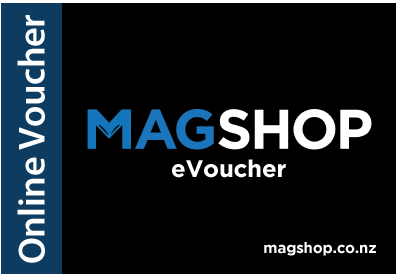 This eVoucher can only be redeemed online at www.magshop.co.nz. Magshop accepts no liability for eVouchers that have been lost, stolen, forged, damaged or tampered with in any way. eVouchers are not transferable or exchangeable and cannot be taken as cash. Where the subscription is more expensive than the eVoucher, it is the customer’s responsibility to pay the balance via credit card or PayPal. Cannot be used to purchase auto renewal or digital subscriptions.